The #1 bestseller Proof of Heaven has already touched millions of lives, turning skeptics into believers in the existence of a universal dimension characterized by peace, acceptance and unconditional love that is accessible to all of us. 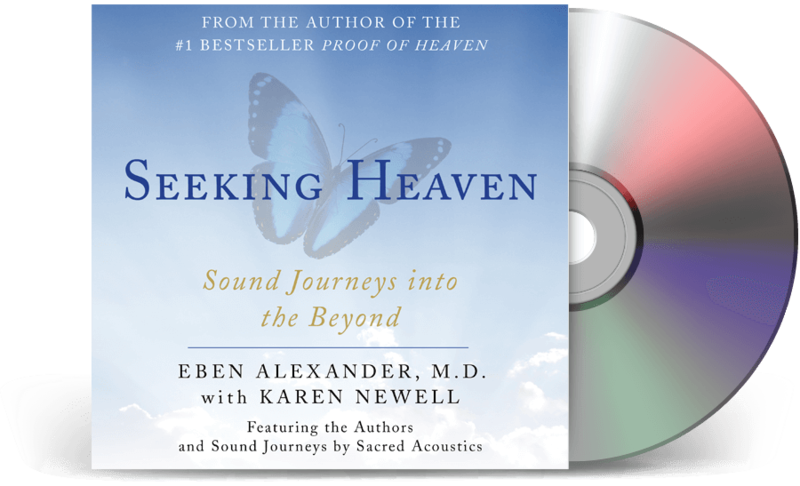 In the closing pages of Proof of Heaven, Dr. Alexander writes that he uses meditation audio programs to achieve the altered state of mind that enables him to return to the idyllic realm he describes in the book, and suggests that readers and listeners can use similar audio programs to alter their consciousness and achieve comparable results. These journeys to the spiritual core of existence are designed to help you separate yourself from day-to-day concerns and find out about your true self, appreciate the nature of our interconnectedness, and access a transcendent understanding of hope, comfort, forgiveness and love. With Seeking Heaven, Dr. Alexander helps you get in touch with the profound wisdom imparted in the spiritual realms he visited and experience it in your own life. Karen Newell is a life-long seeker of esoteric wisdom and has amassed a wealth of firsthand experience exploring realms of consciousness. Cofounder of Sacred Acoustics, she teaches how to enter and engage with expanded awareness in order to connect to inner guidance, achieve inspiration, improve wellness and enhance intuition. “While I had positive expectations buying these sound journeys, after reading Dr. Alexander’s Proof of Heaven, listening to EMDR recordings, and various different sound based meditation techniques, including spending time with monks in a Cistercian monastery, and working guided meditations in a Buddhist retreat, this was the first that I found to be as moving as it was. Have only listened to CD 1 and 2 so far and twice found the experience to be more intense than any other I have heard. Let me be clear, this is a positive experience. Found that both times in the sessions needed to stop and take a deep breath or two to be able to continue. Suspect that the process of letting go triggered an anxiety response at the moment.